Royal palm has a beautiful canopy; it is thin in the two ends and thick in the middle, and looks like a vase, a missile, or the drum of the Dai folks. There is a large piece of royal palm in the Botanical Garden. Since they have been planted for many years, their trucks are very thick, looking from afar, they seem to rows upon rows of missiles ready for shooting; therefore, many people joke that the garden of palms is like a base of missiles. 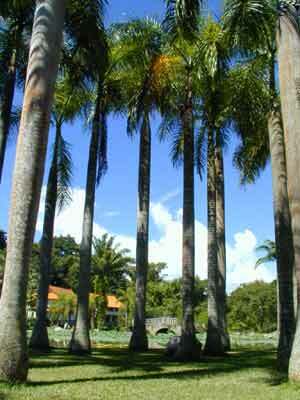 Royal palm could grow as tall as 10 to 20 meters with a thickness of 1 meter. They stick themselves out from hundreds of palm plants with their great trunks and their kingly airs, and look like the kings of all palms. Though the native land of royal palm is far in Cuba of America, it now scatters in all tropical districts of the world; and it is also widely planted in Canton, Guangxi, Yunnan and Taiwan of China. The palm is often planted along the roads and is a normal forestation plant. Royal palm brings forth great fortunes to the nursery suppliers each year.